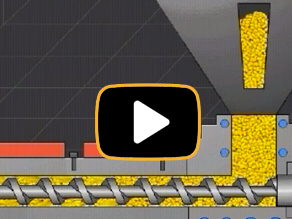 This program uses state-of-the art animation technology to teach the fundamentals of single screw technology, including parts and operation, plastics used for extrusion, extruder controls, safety procedures, troubleshooting and more. Course Description: Dive into the latest technology of the single screw extrusion process – from start-up to shutdown. Learn about extrusion machinery, plastic behavior, and how to maximize the productivity and efficiency of the extruder. Through nine lessons, you’ll learn to optimize the extrusion process, quickly solve problems, and develop advanced troubleshooting skills. The Paulson extrusion program is making our employees more efficient and their troubleshooting skills are improving! We operate 24 hours a day and the Paulson Interactive courses allow us to train all employees around our busy production schedule — without stopping machines! The thing that I like most about using the training programs from Paulson is the flexibility of them. If an extruder operator has some down time, they can take a lesson and come back without interrupting their work schedule. Also, as problems come up, we use the training to find solutions to our specific problems.